FixThePhoto offers a collection of free Photoshop actions that includes portrait, vintage, wedding, and cross processing actions bundles. Photoshop actions for portraits has free bundles for newborn photography that you can use to enhance the child’s reddish skin and make the colors warm and pastel. Here you will also find Photoshop actions that improve male and female images made indoors/outdoors: make skin smooth, eyes bright, teeth whiter or add eyelashes. A big range of color settings including rich, grainy b&w, bleach bypass, and some heavy casting effects. Great for experimentation. If you deal with fashion photography, you can download free PS actions in vintage, sepia, retro, and dramatic effect. Make the colors vivid and pop in several clicks. If you design wedding cards, envelops or invitations, wedding Photoshop actions will be very useful. Different B&W, matte and pastel effects are ready to improve your projects and give them a professional touch. All these free Photoshop actions have helped many creative and beginning designers realize their craziest projects and now can be useful for your works. All these photo retouching freebies empower you to design like never before. Don’t waste your time repeating the same steps to achieve an effect – use these Photoshop actions free for personal and commercial purposes. Create beautiful designs with FixThePhoto. 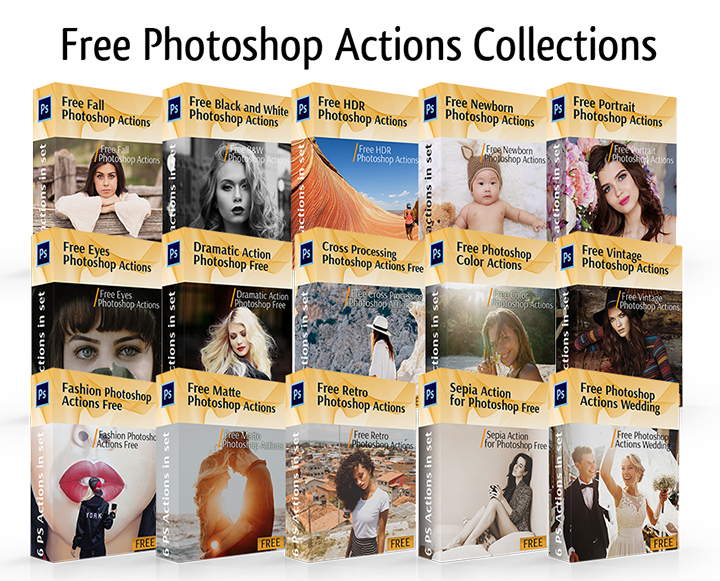 Get the free Photoshop actions here.